What is a Pearson correlation? A Pearson correlation, also known as a Pearson Product-Moment Correlation, is a measure of the strength for an association between two linear quantitative measures. 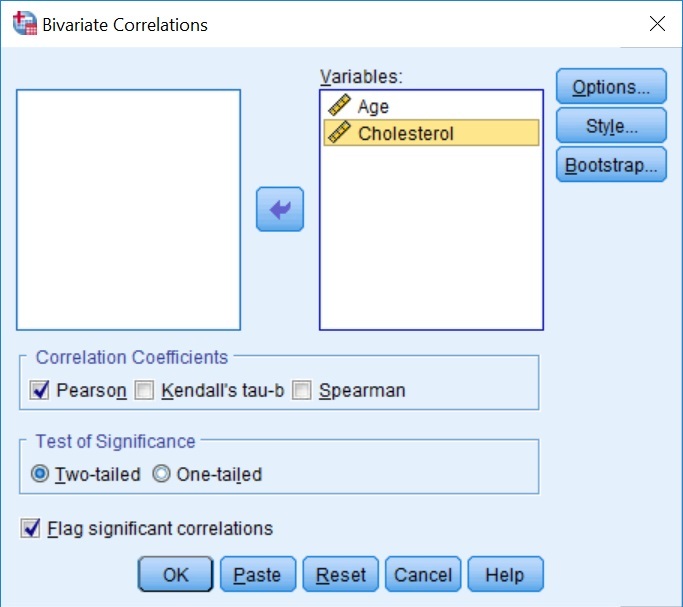 For example, you can use a Pearson correlation to determine if there is a significance association between the age and total cholesterol levels within a population. This is the example I will use for this guide. The two variable of interest are continuous data (interval or ratio). The two variables should be approximately normally distributed. Refer to our guide on normality testing in SPSS if you need help with this. There should be a linear relationship between the two variables. Plot them on a scatterplot to see their association. There should be no outliers present. I have created a simple dataset containing 10 rows of data, each row signifies one person. 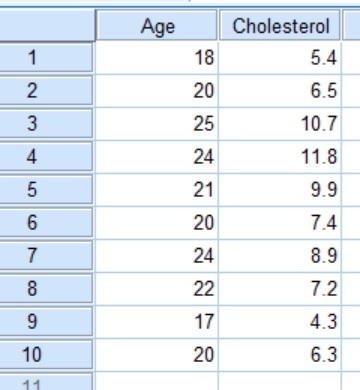 I have two variables, the first being Age (in years) and the other being blood total Cholesterol levels (in mmol/L). There is no correlation between participant ages and blood total cholesterol levels. There is a correlation between participant ages and blood total cholesterol levels. 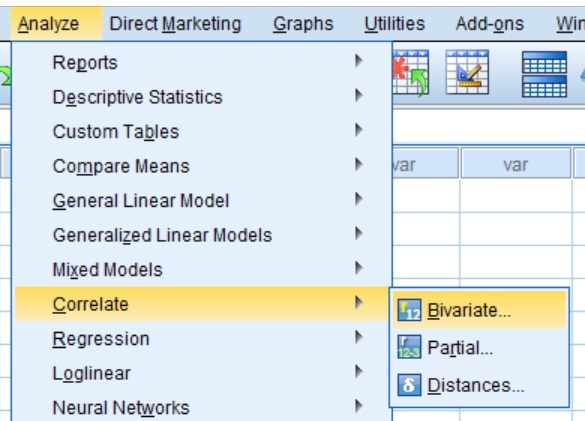 Within SPSS, go to Analyze > Correlate > Bivariate. A new window will open called Bivariate Correlations. Here, you need to specify which variables you want to include in the analysis. Drag both variables from the left window, to the right window called Variables. In this case, both Age and Cholesterol will be moved across. Note, that you can drag more than two variables into the test, with each combination possible being tested for at the same time. 2. Ensure that Pearson is ticked under the title Correlation Coefficients. Since we have not made any prior assumptions, we will also leave the Test of Significance as Two-tailed. 3. Click the OK button to run the test. By going to the SPSS Output window, there will be a new heading of Correlations with a correlation matrix displayed. Within the grid, there are three pieces of information which are listed below. 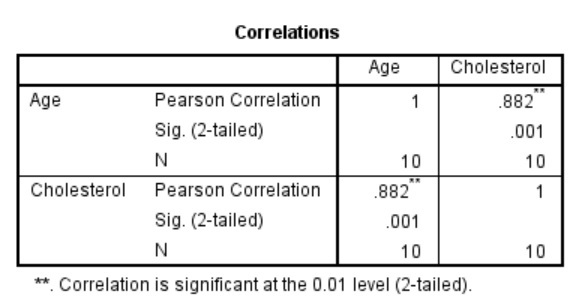 Pearson Correlation – This is the Person Correlation Coefficient (r) value. These values range from 0 to 1 (for positive correlations) and -1 to 0 (for negative correlations). The larger the number, the stronger the linear association between the two variables i.e. a value of 1 indicates a strong positive association and a value of -1 indicates a strong negative association. A value of 0 indicates no such association. Sig. (2-tailed) – The P value for a two-tailed analysis. N – The number of pairs of data in the analysis. By looking at the results in the above table, it can be seen that the correlation between age and blood cholesterol levels gave a Pearson Correlation Coefficient (r) value of 0.882, which indicates a strong positive association between the two variables. Also, the P value of the association was 0.001, thus indicating a highly significant result. Therefore, I will reject the null hypothesis.